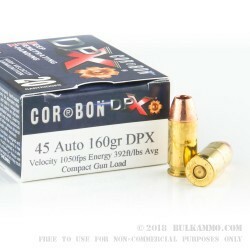 A very interesting personal defense load from Cor-Bon that gives you a unique way to prepare for any tactical situation you might find yourself in. 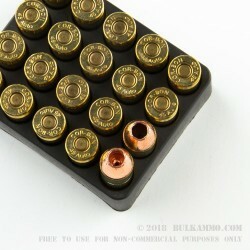 The all copper projectile is presented in a unique hollow point design with a grain weight of 160 grains which is indicative of the lack of lead, but also indicative of a particular set of ballistics in mind. 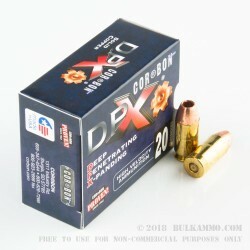 Cor-Bon has a reputation for fine ammunition with premium components and good stopping power, the long term studies in the public law enforcement sector and solid perennial performance in gelatin tests presented it as a very good defensive choice. This .45ACP load offers a good mix of recoil reduction, high velocity and ability to cycle short frame/short slide combinations allowing it to be used in specialty builds for concealed carry and by those who want to shoot for very specific ballistics. The all copper projectile will hit hard, with a higher velocity than most mainstream .45ACP loads and will retain more of the bullet weight. The cupped design offers good deformation and seems to do well in multi-layered testing compared to many other self-defense rounds. Expect 1,050 feet per second when it comes to muzzle velocity and 392 ft. lbs. of energy at the muzzle makes this a different type of cartridge. 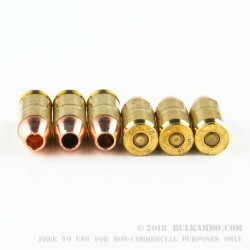 The higher velocity and lower energy level combined with a all copper bullet design offers good penetration, and a moderate wound channel without the concerns that heavy projectiles have.